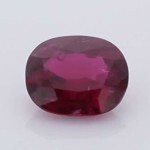 A very fine Ruby oval shape with colour, clarity and brilliance. This is astrologically the appropriate life stone for Rising Sign Lagna Leo regarding stability, vision, imagination, stability from any crisis, drive, health, fitness & establishment. It is also suitable for the signs with Lagna Cancer, Scorpio & Sagittarius regarding flow of income, wealth, assets, savings, power in speech presentation, profession, career, status, prestige, honour, ability, rise in luck, prosperity, rising and success. This gemstone is considered an absolute must for all people dealing with the legal profession, professional political leaders or anything related to authority, law & Govt.